Dirt track or "nat track" racing is the most fundamentally American form of motorcycle sport. A lithe leading American riders- even those who race in Grand Prix speed events have passed through this tough and longestablished school of racing on beaten earth. Road racing apart, there are four types of dirt track: the mile, half mile and short track ovals and the TT steeplechase (with right and left turns and a huge jump), and the five disciplines made up the AMA Grand National series, perhaps the most testing form of motorcycle competition on the calendar. For years dirt-track racing was the undisputed domain of Harley-Davidson. Then came the Japanese. Though Harley buffs would wear slogans like ''I'd radher eat worms than ride a Honda" across their T-shirts, the Japanese giant had very good commercial reasons for muscling in on this most American of sports and spent vast sums of money – even building one-of-a-kind racers – in its effortto knock Harley out of the top slot. Eventually, it succeeded, with Ricky Graham taking the title in 1984 and Bubba Shoben following suit hom 1985 to 1987. Since then, Honda has restricted itself to backing riders like Ronnie jones, whose very special XR 600 is one of the few alternatives to Harley's nearmonopoly of the sport. It boasts a superhot version of the XR 600 engine using many HRC racing components incorporated by the tuner, a hand-made C & R double cradle frame and a special Sbowa fork. The rest is all down to skill and courage. 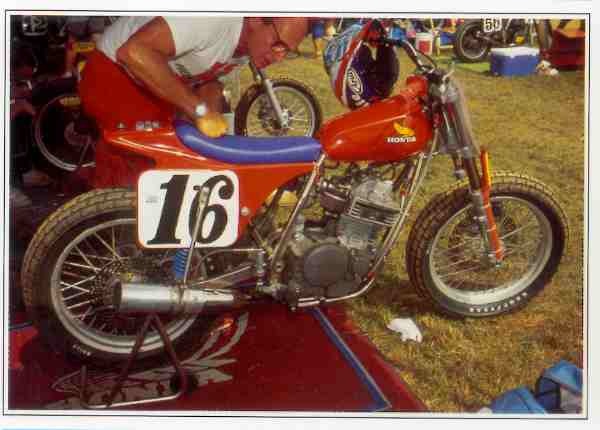 The Honda XN 600 dirt-track racer of Ronnie Jones is a real fire-breather witb a power output in excess of 70 hp.